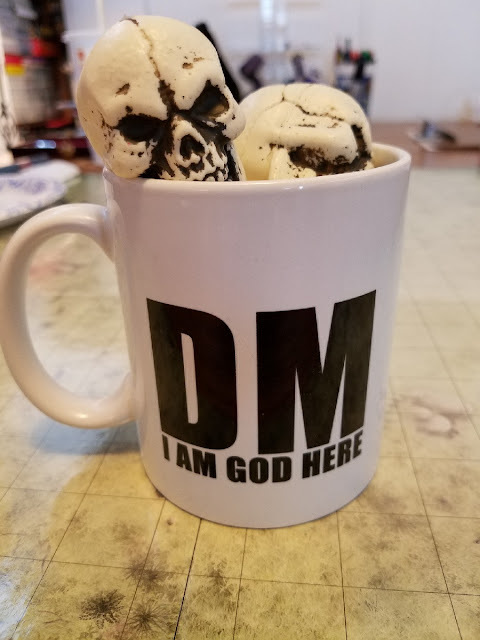 My partner took this pic before Saturday's game, so I thought I'd talk a bit about why there's a mug full of skulls sitting in front of us as we play. Surely, a gentle reminder never hurts! One of the things that I love about the current and previous iterations of the game are the little nuances in the rules that allow characters (and monsters) to improve their chances of doing something heroic in combat - things that give them an edge, and that break the back-and-forth slog that a lot of combats in older versions of Dungeons & Dragons tend to descend into. All too often, when the PCs faced large numbers of opponents and/or powerful opponents, after the first couple of rounds had passed (and all of the characters' and monsters' cool abilities had been spent) combat became a matter of sides taking turns rolling to hit for basic attacks and logging damage. It could get a little boring, which - in my opinion - no one should ever be able to say about an encounter with an ancient dragon or a demon-lord. System elements such as action points, inspiration, DM fiat to award advantage for cool character actions, etc. help prevent that monotony. They also allow the players to control the story somewhat, letting them do dramatic things when they matter most. And if you need to know only one thing about my DM/GM style, it's that I'm a sucker for dramatic scenes. 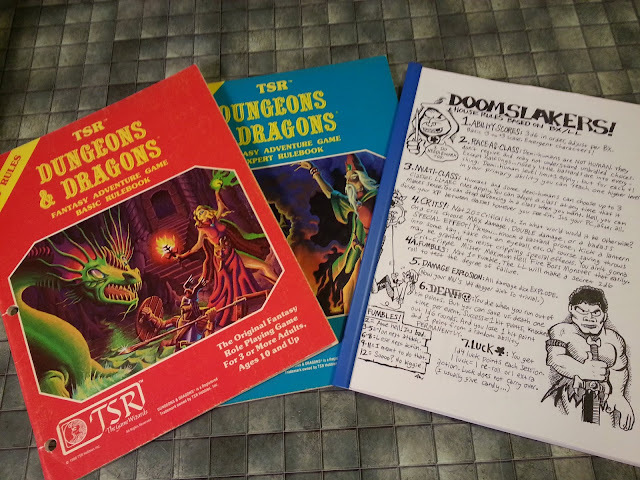 We're playing our current campaign using Moldvay/Cook B/X D&D, which doesn't have any of the story-based, player empowerment rules that exist in modern versions of the game. What it does have is a very simple rules set that practically invites house ruling. (Not so much because it's lacking due to its simplicity, but more because its simplicity makes it so easy to turn it into the game you want it to be.) Now, I'd already introduced DM-provided advantage/disadvantage rolls into our game, but I wanted to increase player empowerment a little more, so I introduced the skull system. This system allows the players to take a boon from the Fates to aid their characters instead of waiting for them to come to them. By taking a skull, the player can: 1) get advantage on a single roll (made for anything - attacks, saving throws, etc. ), or 2) take an extra action at the end of their turn (effectively adding action points to the game). Of course, the Fates must be repaid for such a boon, so once the player has completed their character's turn, they hand the skull to the me, the DM. I can then use it to do the same for one of my monsters or NPCs. I think this is a nice way to add player empowerment to the game, but to add a little dramatic tension when doing so. It's always an existential crisis for the players when they take a skull, because they know it will haunt them later.